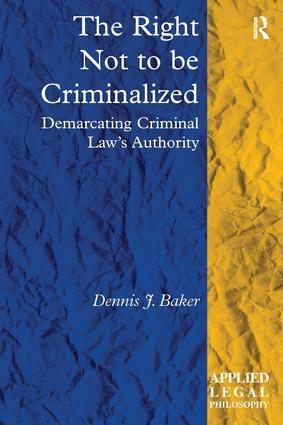 This book presents arguments and proposals for constraining criminalization, with a focus on the legal limits of the criminal law. The book approaches the issue by showing how the moral criteria for constraining unjust criminalization can and has been incorporated into constitutional human rights and thus provides a legal right not to be unfairly criminalized. The book sets out the constitutional limits of the substantive criminal law. As far as specific constitutional rights operate to protect specific freedoms, for example, free speech, freedom of religion, privacy, etc, the right not to be criminalized has proved to be a rather powerful justice constraint in the U.S. Yet the general right not to be criminalized has not been fully embraced in either the U.S. or Europe, although it does exist. This volume lays out the legal foundations of that right and the criteria for determining when the state might override it. The book will be of interest to researchers in the areas of legal philosophy, criminal law, constitutional law, and criminology. Contents: Preface; Unprincipled Criminalization; Taking harm seriously as a criminalization constraint; The limits of remote harm and endangerment criminalization; The harm principle vs. Kantian criteria for ensuring fair criminalization; The moral limits of consent as a defense to criminal harm-doing; The morality of criminalizing conventional wrongs; Conclusion; Bibliography; Index. Dennis J. Baker (M.Phil., PhD Cantab.) joined the Law School in 2008, leaving the Chinese University of Hong Kong where he had taught Criminal Law and Procedure and Penal Theory on the postgraduate JD programme. He has also taught undergraduate criminal law at the University of Cambridge and Equity and Trusts, Comparative Law and Criminal Law at the University of Western Sydney (Australia).